It has been hypothesized that highly productive coastal ecosystems, such as seagrass meadows, could lead to the establishment of ocean acidification (OA) refugia, or areas of elevated pH and aragonite saturation state (Ωa) compared to source seawater. However, seagrass ecosystems experience extreme variability in carbonate chemistry across short temporal and small spatial scales, which could impact the pH buffering capacity of these potential refugia. Herein, short-term (hourly to diel) and small-scale (across 0.01–0.14 km2) spatiotemporal carbonate chemistry variability was assessed within two seagrass meadows in order to determine their short-term potential to elevate seawater pH relative to source seawater. Two locations at similar latitudes were chosen in order to compare systems dominated by coarse calcium carbonate (Bailey’s Bay, Bermuda) and muddy silicate (Mission Bay, CA, USA) sediments. In both systems, spatial variability of pH across the seagrass meadow at any given time was often greater than diel variability (e.g., the average range over 24 h) at any one site, with greater spatial variability occurring at low tide in Mission Bay. Mission Bay (spatial ΔpH = 0.08 ± 0.08; diel ΔpH = 0.12 ± 0.01; mean ± SD) had a greater average range in both temporal and spatial seawater chemistry than Bailey’s Bay (spatial ΔpH = 0.02 ± 0.01; diel ΔpH = 0.03 ± 0.00; mean ± SD). These differences were most likely due to a combination of slower currents, a larger tidal range, and more favorable weather conditions for photosynthesis (e.g., sunny with no rain) in Mission Bay. In both systems, there was a substantial amount of time (usually at night) when seawater pH within the seagrass beds was lower relative to the source seawater. 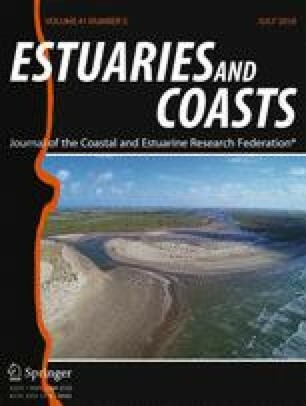 Future studies aimed at assessing the potential of seagrass ecosystems to act as OA refugia for marine organisms need to account for the small-scale, high-frequency carbonate chemistry variability in both space and time, as this variability will impact where and when OA will be buffered or intensified. The authors would like to thank the Ocean Discovery Institute (ODI) and over 30 middle school students from the City Heights area in San Diego who helped collect data in Mission Bay. We would also like to thank the staff of the Bermuda Institute of Ocean Sciences (BIOS) for their support during the Bailey’s Bay study. This research was part of NSF grant OCE 12-55042 (AJA).